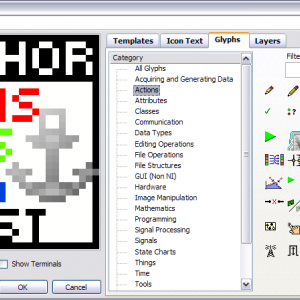 This is a version of the LabVIEW 2009 Icon Editor that has several cosmetic improvements (along with some bug fixes). Note: The installer does backup the existing icon editor that will be restored (if you were to uninstall this version). [New Feature] Add a condensed pixel font (called: "Pixel Font: PF1") that allow for longer text to be entered. [bug Fix] Synchronize the "Edit>>Show Terminal" menu with the "Show Terminal" check box. [bug Fix] CAR 186982: "[iE] Wrong Icon is loaded in Icon Editor". [New Feature] CTRL Key will show the color picker while the text tool is selected. [bug Fix] Mouse coordinate drawing in icon was off by (3,3) pixels (the picture control edge thickness). [New Feature] Add a "Merge All User Layers" button. [New Feature] Optimize glyph display by removing unnecessary blank space between glyphs (went from 6x6 grid to 8x8 grid). [New Feature] Automatically update the "glyph path string" as the mouse move over the glyphs. [bug fix] Car 183609: Glyph path string is not reset when a glyph is dropped (or when a new category is selected). [bug Fix] Scrolling the glyph array should not update the glyph path string. [bug Fix] "Glyph path string" should not be click-able (disable it). [Change / Bug Fix] Picking white color (255,255,255) result in grayish (246,246,246) color selected. Now the resulting color is (254,254,254). [Cosmetic Change] Major redesign of the layer control visual aspect. [bug Fix] The text marker (^) is hidden behind other objects. [bug Fix] CAR 182992 File save (template or glyph) failed if the hierarchy has folder with a dot in its name. [bug Fix] Flush glyph filter when changing glyph category. [New Feature] Glyph filter works only on the visible category and does not reset the category to all anymore. [bug Fix] Selection and glyph drop was broken in the original IE. [bug Fix] If you paste text into an empty line, the icon is not updated. [bug Fix] If you paste text into an non empty line (while the content is selected) the clipboard content is append to the selected existing content (the existing selected content should be wiped out). CAR 182828: Manual User Input always cancels even when ok is pressed. [New Feature] This package does stop the IE if it is running prior to installing it. [New Feature] This package does compiled the IE after installation. [New Feature] This package does backup the existing Icon Editor prior to install the new one. [New Feature] This package does restore the previously installed IE upon un-installation. [New Feature] This package also include the original IE UI in LVrootresourcepluginsOriginal lv_icon.vi (rename it to lv_icon.vi to use it). 151661 - This change fixes the copy/cut ability of the icon. If a region is selected and/or a layer is selected, copy and cut is enabled. 179007 - The key binding is messed up. The mirror tool has set as the toggle key, whereas the OK button should have to set the focus. UI Reorganization (toolbar on the left among other things) [Note: This required code changed since the existing code was relying on hard coded constants]. Edit the color selector double arrow (/|->) to remove unsightly pixel and add transparency. Conform to UI design by using system color in the background instead of white. Hide glyph scrollbars when not needed. Edit the layer "eye" to use alpha transparency (not so great result as it is, but I think it is better). Edit the layer preview by adding a system frame around it (from a string control background). Add a "Show Terminals" check box on the panel for quick access (similar to the previous icon editor). Change the icon preview so it is rendered in 8-bit (instead of 24-bit). You will need VI Package Manager to install the modified icon editor.